An important part to making any entrepreneurial community successful is connecting resources from the educational community to the entrepreneurial community. These connections bring value to both stakeholders’ missions in the Orlando community. Canvs welcomes the University of Central Florida (UCF) and Rollins College as formal partners to create joint educational programming for coworkers and the community, mentorship opportunities, an internship program for companies working in the space, and connection to all of the entrepreneurship resources on both campuses. This collaboration will create a strong pipeline between the region’s university entrepreneurship programs and the downtown startup community. It also furthers Canvs’s mission to educate and inspire the next generation of entrepreneurs. Interns from UCF’s College of Engineering and Computer Science and College of Business Administration, and Rollins’s Crummer Graduate School of Business will be welcomed into the Canvs space for mentorship and to assist Canvs members. The regular programming planned for the Church Street Exchange will include presentations by educators from both schools and events developed in partnership with the UCF Venture Accelerator and Florida Angel Nexus. To strengthen the partnership, the dean of the College of Engineering and Computer Science at UCF, Michael Georgiopoulus has joined Canvs’s board of advisors. Opening day is close to a month away for Canvs, and construction is ongoing. Stay up to date on the progress through our Facebook album [here]. Check out the plans for the space below. Canvs is a nonprofit coworking space and entrepreneurial community that will provide tech startups with flexible workspace options, regular programming, mentorship and a variety of business development resources. Canvs’ mission is to provide a support structure for new companies and anyone interested in growing their business. Founders Philip Holt, V.J. LeBlanc, Jeremy Paulding and Chris Staymates – the founding team behind SPLYT – have applied lessons learned from their startup journey to the creation of the 17,189 sq.ft., thriving tech center in the heart of downtown Orlando. For more information, visit Canvs’s website (www.canvs.org), Twitter (@CanvsORL), Instagram and Facebook page. 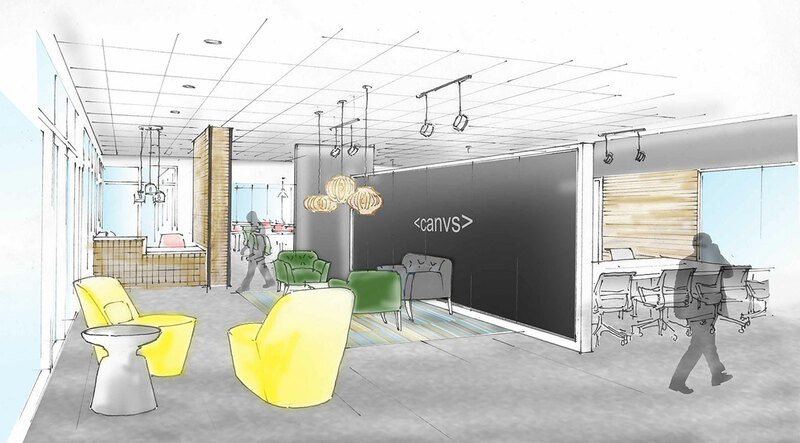 Canvs will join another new coworking space in downtown Orlando. Recently Catalyst announced its plans to open for business in Fall 2014 at 1 South Orange Ave.